Join Jason Hartman and author of Primal Body, Primal Mind, Nora Gedgaudas, as they explore the negative effects of stress and anxiety on our brains and how nutrition is essential to a healthy brain. Nora explains how high levels of stress causes dumps of cortisol, leaving the brain “marinating” in it, and how it breaks down the temporal portion of the brain. Doctors tend to accept this breakdown as a sign of aging, but Nora says this is simply not the case. Just because something seems commonplace does not mean it is normal. Nutrition plays such an incredible role in our overall health. Our food and water sources have changed to something completely unrecognizable to our ancestors, who ingested animal fat and protein primarily and were stronger and more disease-free. When we’re stressed, we often crave carbohydrates and this comes from the body expecting it because that’s what we’re feeding it. Nora describes how sugar is like kindling for the metabolic fire, burning quickly and constantly needing to be replenished. Contrary to today’s popular beliefs and fads, the fuel our bodies are designed to run on will surprise you. 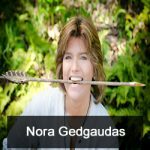 Nora provides insight into how to end the cravings and rollercoaster dieting, and also explains the problems with vegan and vegetarian diets, and talks about gluten sensitivity, the rise in inflammatory issues and autoimmune dysfunctions.